Hand saws and parts and attachments will be the fastest growing product areas. Hand saws experienced large declines during the Great Recession and have yet to recover fully to previous levels of demand. Relatively fast sales gains are expected for these products as demand continues to climb to previous levels, although faster growth will be prevented by competition from power saws. 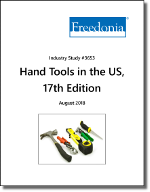 Parts and attachments will benefit from overall sales of hand tools, as well as a large stock of hand tools in use in the professional market that needs repairs.